1. Use a piece fabric for the backing. I don’t have a little girl anymore. Mine is 11 1/2, so I totally had to guess. I actually used my 9-year-old son’s measurements and then scaled it back a bit. I am not really sure what size child it will fit, but not mine. I started with an orange backing piece that was 12″ X 14 “, but by the time I hemmed the sides, it brought the width down an inch or more. 2. 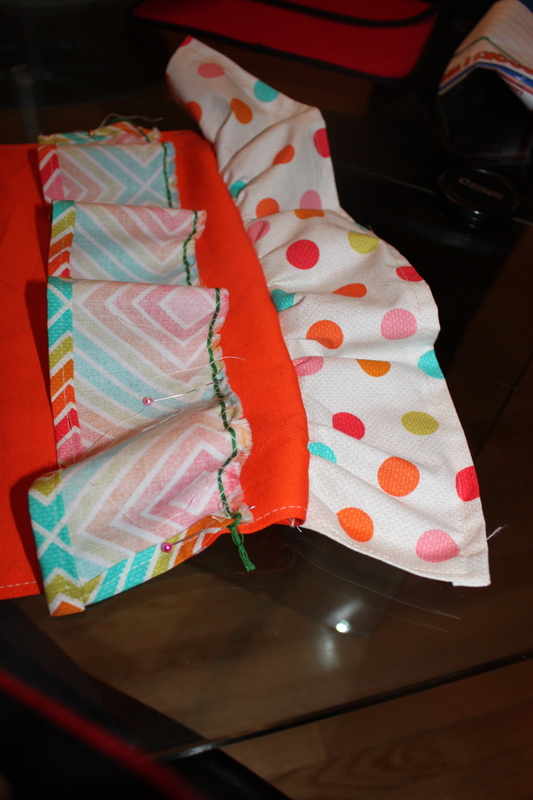 Cut rectangles out of the “ruffle” fabric. 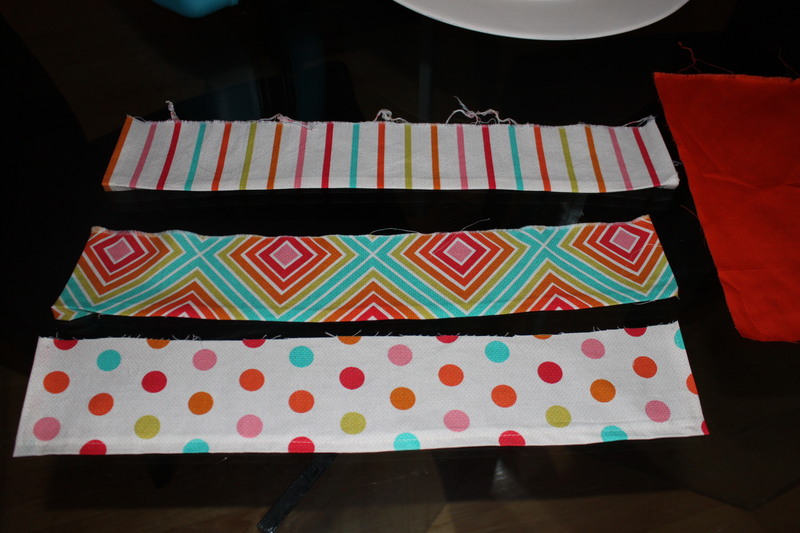 I made mine 4″ X 18″ (1 1/2 times the width of the lining). Take one look at this fabric and you’ll know why I just had to make a play kitchen to go with it! What little girl wouldn’t love this? 3. Hem 3 sides of each of the rectangles, leaving one long side without a hem. 4. 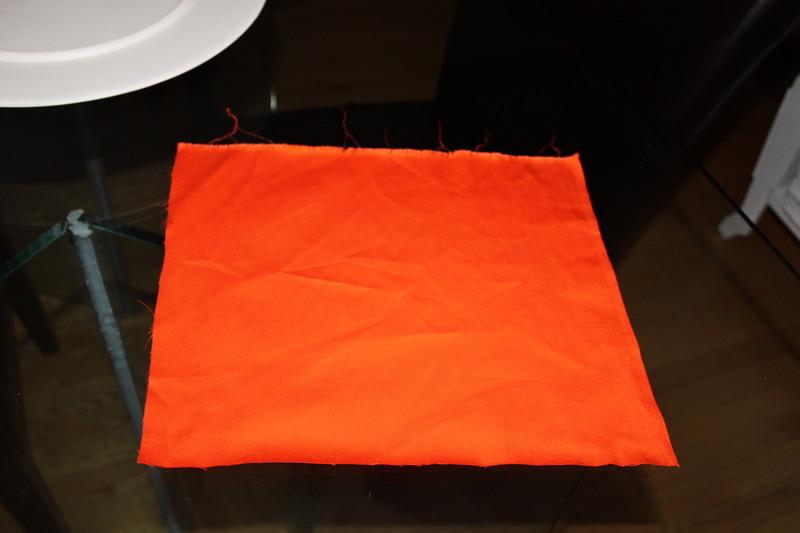 Gather the fabric along the raw edge and pin it to the raw edge of the lining with right sides together. Use the steps from the tutorial in yesterday’s post on how to make simple gathered ruffles, if needed. 5. Determine where you want your second ruffle to be and how much you want it to overlap the bottom ruffle. Pin and sew the second ruffle onto the lining. (It will be sitting with right sides together, but upside down, as you will flip it down to sit over the bottom ruffle. Gather, pin and sew the second ruffle on. 6. Do the same thing for your third/top ruffle. 7. For the waist band, I double folded the top of the lining to make a nice finished seam. 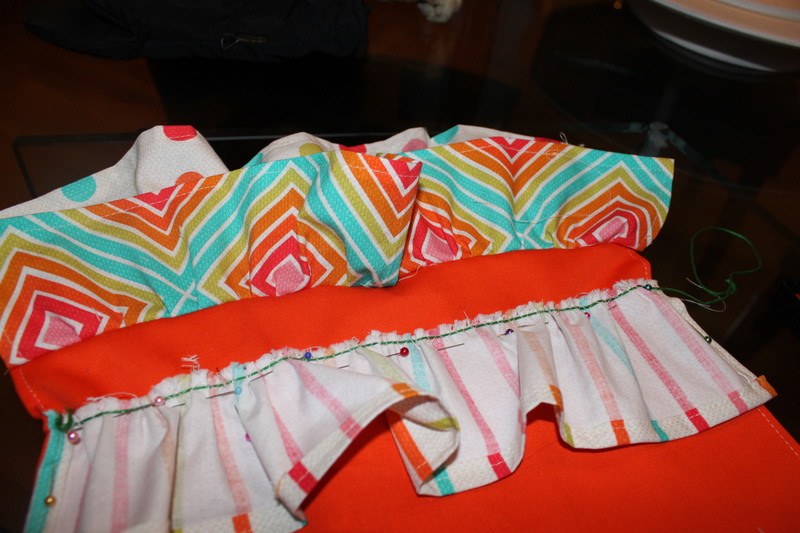 I then folded it over the back of the apron and pinned it just below the top of the top ruffle. 8. 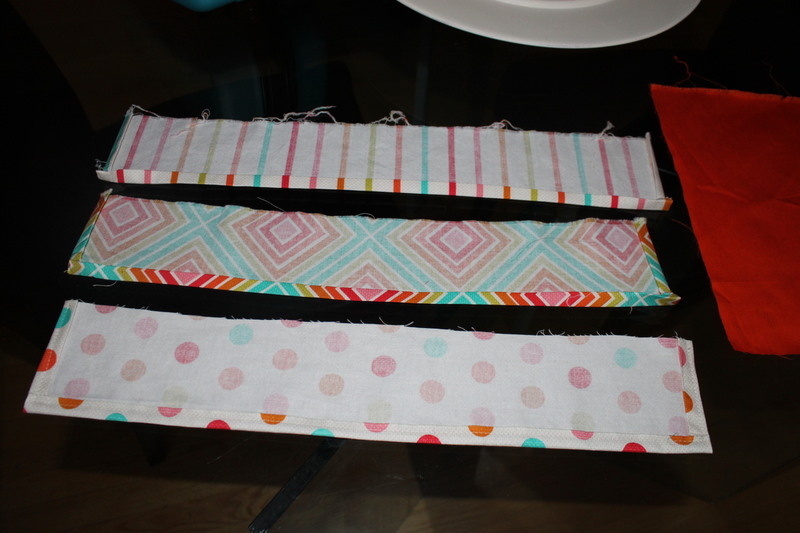 Cut two long rectangles that will serve as the apron “strings”. I made mine about 1 1/2 inches wide. With right sides together, sew along the edge and one end, but leave one end open so that you can turn it “right side out”. This can be a gruelling task. Here is a very quick way to do this job. Stick the handle of a wooden spoon into the end that is sewn closed. Push the spoon in and pull the fabric down the shaft of the spoon. This takes a 15 minute job and compresses it into about 2 minutes tops! Quick and super easy to do, just make sure your width is large enough for the spoon handle to fit inside. 9. I recommend pressing the apron and the apron ties before doing your final sewing steps. Stick the raw ends of the ties into the waistband fold. 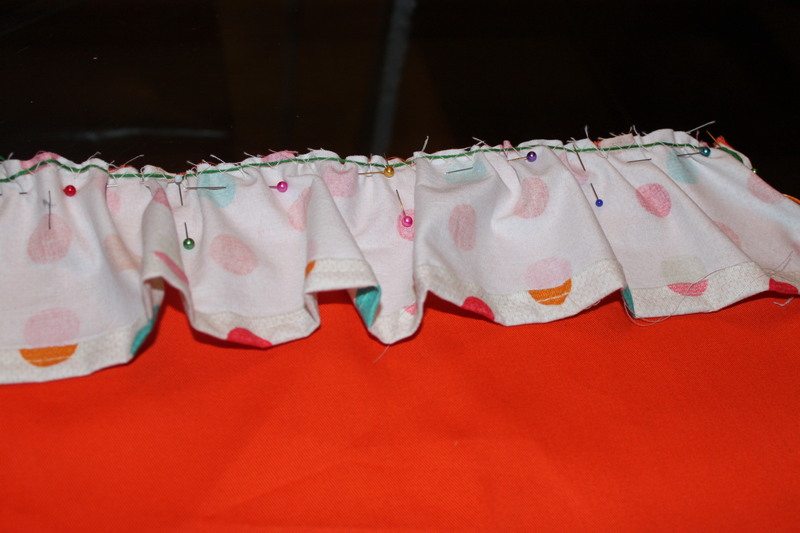 Stitch down the side of the waistband, securing the apron string on one side. Continue to sew along the very top of the ruffle, making sure to “catch” the back of the waste band that you previously pinned to the back of the lining. Finish by stitching up the other side to secure the second tie. Not bad for a first attempt at making an apron. I just love the fabrics! 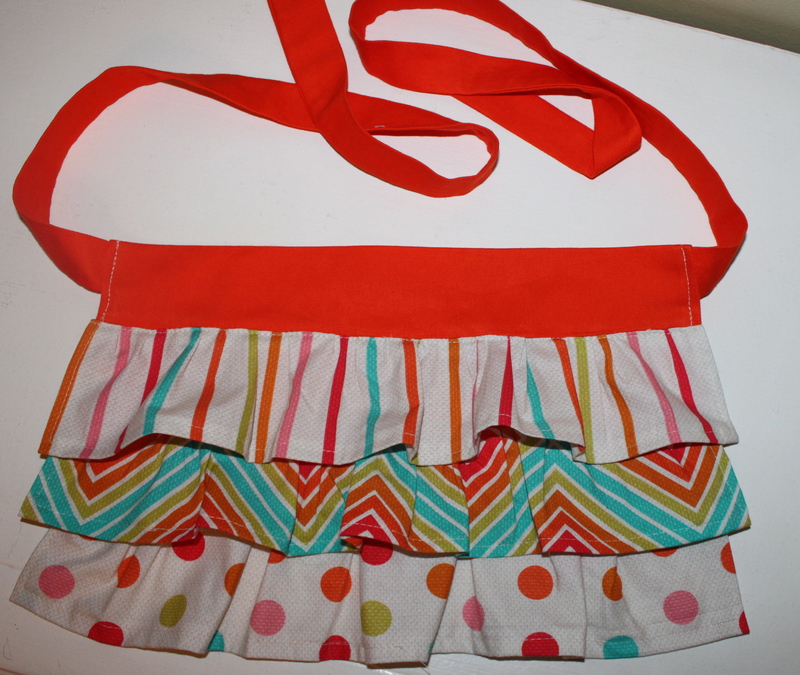 Posted on November 18, 2013 by Cindy Roy •	This entry was posted in Projects and tagged how to make an apron, how to sew a ruffled apron, how to sew and turn a narrow tube rightside out, play kitchen accessories, ruffled apron tutorial. Bookmark the permalink. Very cute, Cindy! Love it! Great idea with the wooden spoon, I will have to remember that one. It’s gorgeous. Great job Cindy,.